FileZilla is good and user friendly program to transfer files to server. 2. Unknown host key (Tuntematon isäntäavain). This popup usually comes only the first you connect to the server. You should check the highlighted checkbox so that this popup will not be shown in the future. After clicking OK connecting to the server will resume. 3. After the connection is made, you will see the files of your PC on the left and the files of the server on the right. Find the desired folder where you want to transfer the files. Usually this folder is public_html. This folder can be with different name if the customer has created several subdomains and own folders for each of them. 4. Find the files to be transferred on the left box. 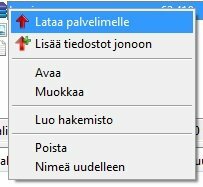 After you have found and selected them, right click on them and choose Upload (Lataa palvelimelle) from the dropdown menu. Make sure that there is correct folder selected on the right box so that the files go where they should.